National University Degree Admission 2017-18. NU Degree Admission Notice 2017-2018 may refer to the National University Admission 2017-2018. The authority of National University published the notice on 15th January, 2018. In this post, we will discuss about National University Degree admission 2017-18. Students must have to pass their SSC or equivalent exam in 2013/14/15 and HSC or equivalent exam in 2015/16/17 to apply for NU Degree Admission 2017-2018. Students must have to apply online for National University Degree Admission 2017-18. To apply, please visit the official website of National University. You are also providing a direct link to apply for National University Degree 2017-2018. NU Degree Admission Result 2017-18 will be published within few weeks of the compellation of the above application procedure. You will get the result from the official website of National University of Bangladesh. You may also get the result from our website GreenEduBlog.com. 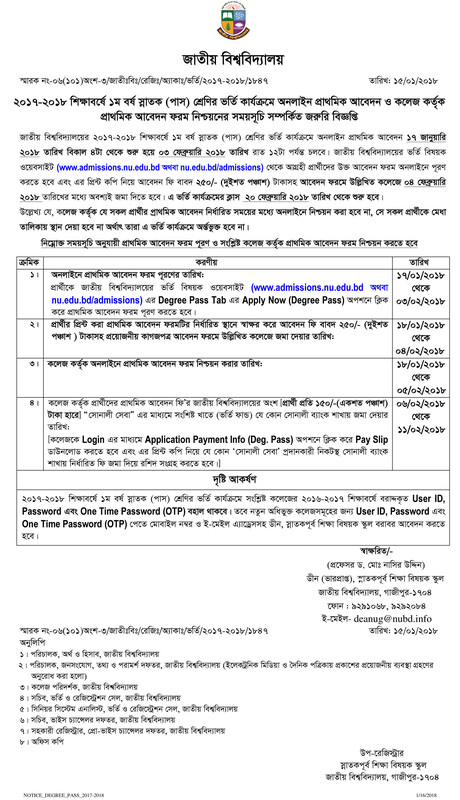 Please bookmark this page to get all the latest updates of degree admission 2017-18 last date, degree admission 2017-2018, degree admission 2017-18 notice, degree admission circular 2017-18, degree admission 2017 bd and other related information. to get all our updates on your timeline.